Our U6 & U8 program has grown extensively over the past few years. When my oldest son, Tyler, started playing in 2011, we had 3 teams total, and that was with the U6’s and U8’s combined. This year (2019), we’ve got 8 teams total; 3 U6 teams, and 5 U8 teams. Luckily our home facility is the Olympic Oval, so we have a ton of space and extra options that most programs wouldn’t have as possibilities. Every program is different… So not everything that’s working for us will work for you. But feel free to borrow any ideas that might make sense for your organization! As an FYI, we’ve moved the U6 program onto the back side of the oval, and divided that section out into 3 stations during their sessions. So our current practices have only kids playing in the U8 division, which you’ll see in the sample video. We practice twice per week, for 60 minutes each time, and do station-based practices as per USA Hockey’s ADM recommendations. On Tuesdays the kids rotate through the stations with players of similar age and skill level. On Thursday’s the players rotate through the stations with their teams and coaches. We have one person who plans the practices each time (this has been me). Doing it this way helps keep the development consistent from station to station, practice to practice, and year after year in my case. Like any volunteer program, our ranks have a mix of coaches who have lots of experience, and coaches who are complete beginners. All are welcome, all are needed! We assign our more experienced coaches to teach the technical-skill stations, and try to give the less experienced coaches opportunities to work with them so they can learn. I also send out a quick video walkthrough before each practice with an overview of each station, so the coaches know the key development points for whatever drill they end up at. It’s great to have a practice plan, but if the person running the drill doesn’t know why the designer put that drill into the practice, you don’t get the full benefit. Our advanced kids are quite capable. Our beginners are still coming along. All are still learning! I generally try to plan to the needs of the advanced groups, then scale drills down as needed for the other groups. I don’t usually take a station myself. But I bounce around from station to station to make sure the drills are running smoothly, and that the coaches have what they need. From time to time I’ll make a recommendation if we need to simplify a drill for a less-experienced group. In the above example, the Advanced groups were capable of running the basic breakout patterns, but we switched to a cross-ice scrimmage for the Beginner and Intermediate groups. 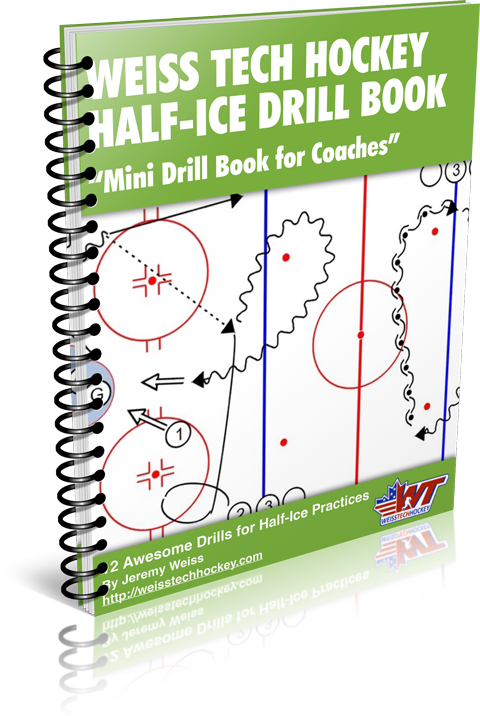 As a side note, I know many coaches shy away from teaching positional concepts at this age, and you may be thinking that the breakout drill in this practice plan is unfit for U8’s. If you’re one of them, no problem. Do what works for you. Every coach can formulate his or her own philosophies. For me, I’ve had success teaching basic positioning at the U8 level. 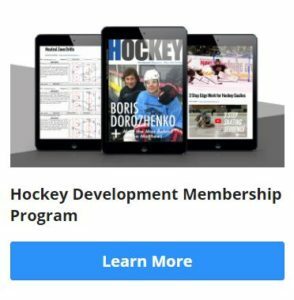 If you’re interested in knowing more about my philosophy on this, you can check the link here >> Do Systems Rob from Skill Development? In my opinion, the U8 level is all about learning to have fun in hockey development. Hockey doesn’t become fun until you have a certain level of proficiency. Once you can skate, hockey becomes fun. Once you can puckhandle, hockey becomes even more fun. Shooting is fun. Scoring goals is fun. Competing is fun. If we can bring the kids up to that level of proficiency, they will learn to love the game, and they will stay in the game longer. Hockey is hard, and if the kids never learn to skate or control a puck, the game isn’t fun and they quit. I believe this is one of the reasons our program has grown so much in recent years. Kids come in, develop, and stay.